When you have dry, rough, irritated skin you need something that will moisturise to help it heal fast. In our Vaseline Intensive Care Advanced Repair unscented lotion, we’ve combined healing micro-droplets of Vaseline Jelly and our highest levels of moisturising glycerine. The result is a rich lotion that gives you intense moisturisation. It deeply moisturises to heal very dry skin in only 5 days and is suitable for sensitive skin. 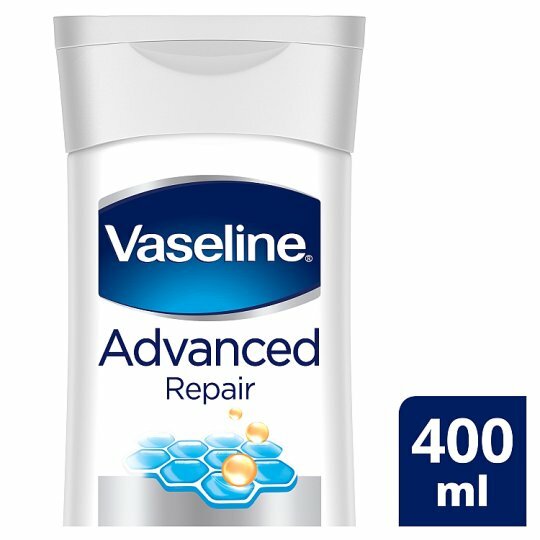 Vaseline Intensive Care Advanced Repair lotion provides prescription strength moisturisation without the prescription to restore soft, healthy looking skin. The micro-droplets of Vaseline Jelly penetrate deep down to form a protective layer on your skin and lock in moisture. This sealing barrier speeds up the skin’s natural barrier recovery. Advanced Repair lotion also contains glycerin and dimethicone, which draw moisture to the skin to rehydrate very dry skin. With this combination of deeply moisturising ingredients, Vaseline Advanced Repair lotion offers you fast relief for dry, itchy skin, plus the confidence that is it suitable for sensitive skin. Apply Vaseline Advanced Repair unscented body lotion to your skin daily to experience the rich yet quick-absorbing formula which will give you intense moisturisation, allowing your skin to restore from deep within*.